This week, our guest blogger is Liz Purdy, who recently attained FJV status when she finished up a year of service in Sitka, AK. “One of the best parts of being a JV is that you aren’t just a JV for a year, you’re forever in the network of FJVs once you complete your year of service. Recently, a neighbor of mine in Seattle, where I am now living, had an abundance of produce from a local farm that she needed to give away and she called my house looking for a home to receive some fresh edibles. Though we weren’t able to take them ourselves, I immediately thought that the JVs in Seattle (none of whom I yet know) might want some fresh produce for their houses! It doesn’t matter that I had no idea who the current Seattle JVs are, I’m now an FJV and that’s the unwritten rule of serving with JVC, you take care of your own regardless of knowing them! The idea of sharing with the Seattle JVs immediately came to mind because last year I was on the receiving end of such incredible generosity from FJVs and community members in Sitka, Alaska where I served. On occasion, I would return to my JV house in Sitka to find it stocked fully with dairy products that had been brought by a local church volunteer. A few gallons of milk, dozens of yogurts, and even 18 blocks of cheddar cheese packed our fridge one afternoon after the “dairy fairy” arrived with his latest donation. Since we worked to feed six people on a small grocery budget, not having to buy milk and cheese for several weeks was an incredible blessing! My favorite random encounter with the greater FJV community came in February when I returned on the late night flight to Sitka from our JVC winter retreat in Juneau. I carried my Gonzaga pillow on the plane with me, and while we were waiting for our luggage to arrive in the small Sitka airport, a fellow passenger inquired about my pillow. It turns out he had also attended Gonzaga, and, in fact, was an FJV from the east coast who now served as an Alaska State Trooper in Bethel. He knew the current Bethel JVs and was excited to hear we had just been on retreat with them. As we departed the airport, he said he would stop by the next day at our house to drop something off. Sure enough, after work the next day, he came by with a bag full of goodies for us! We had only shared a five-minute conversation at the airport the previous night, but it didn’t matter — he knew us and our work on some level already because he himself was an FJV. 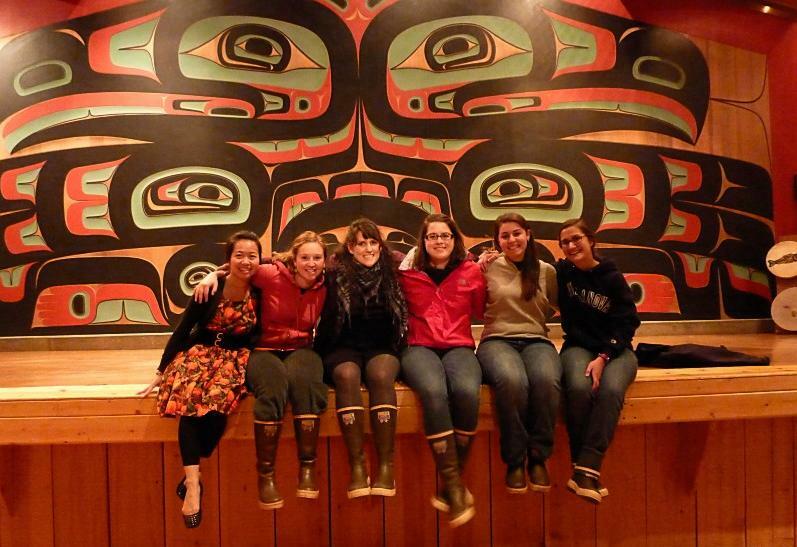 If you would like to read more about Liz’s experience in Sitka, check out her blog at lizpurdy.wordpress.com!